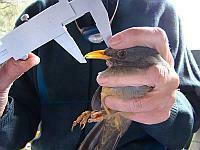 Bird Ringing began in South Africa in 1948. At the moment there are 130 active bird ringers in South Africa, Namibia, Botswana, Zimbabwe, Zambia and Malawi. About 70 000 birds are ringed annually. A bird ringer's tools: rings, calipers, scales, pliers, soft cloth bag for trapped birds, and a data sheet. Bird ringing is a crucial tool for gathering data on migration, longevity, mortality, territoriality, feeding behaviour, and other aspects of bird life. It is a world-wide activity, linking enthusiasts across continents. There are two crucial parts to the activity, firstly the ringing itself, and then "recapture" or "recovery". "Recovery" means finding the ring, with or without the dead bird attached. If you do find a ring, immediately get in touch with SAFRING, with exact details of the ring itself, and the date and place of the recovery. A recapture (or "retrap") is obviously done by bird ringers themselves, who know what to do. Bird ringing is strictly regulated. 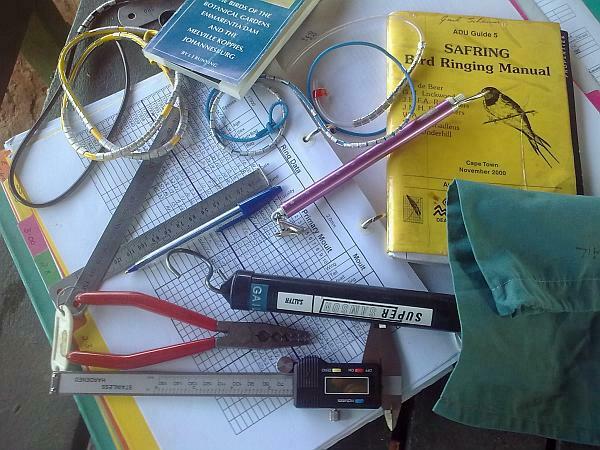 The equipment, procedures, and rules for bird ringing are taxing. You can only become a ringer if you are licensed by the relevant provincial authority, which refers to SAFRING to verify your credentials. You must be trained under an accredited ringer, and must ring 500 birds across 50 different species. 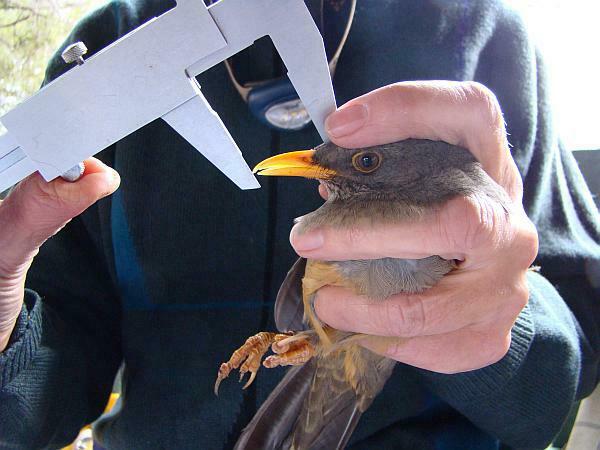 Measuring the culmen of an Olive Thrush. Note the correct birder's hold, which is described in the SAFRING manual. The ringing process itself is far more complicated than the word suggests. The bird must be weighed and measured before the ring is fitted. Statistics that must be recorded are the estimated age, the degree of moult, and measurements of the bill and important wing feathers. The results are sent to SAFRING. The rings themselves are usually an aluminium alloy, but stainless steel, celluloid, and plastic are also used. The complete guide to bird ringing practice is available here: web.uct.ac.za/depts/stats/adu/pdf/ringers-manual.pdf (1732K PDF download). It includes instructions on the methods of capture, how to handle a bird correctly, warnings about how not to stress the bird, detailed instructions about rings and the ringing process, and legal guidelines. Another remarkable project of the Avian Demography Unit is the South African Bird Atlas Project, available at http://sabap2.adu.org.za/about.php. This is an essential reference if you are serious about birds. Detailed statistics and maps are kept for countrywide sightings, using a system of "pentads" - a geographical subdivision of the country. Getting involved in the SABAP project is not difficult, and means that you can become involved in an important scientific project without the rigours of becoming a bird ringer. Visit our gallery of bird ringing photos at: www.mk.org.za/mkbirdgallery.htm.